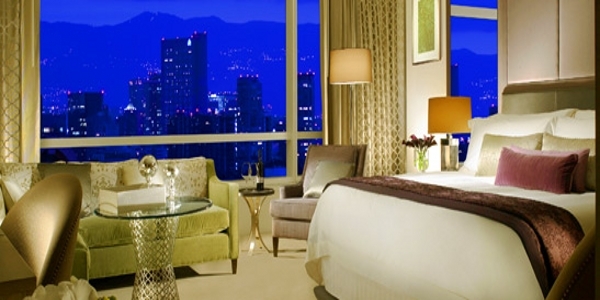 Visit the heart of Mexico’s historic center from the five-star Hilton Mexico City Reforma hotel, situated alongside the city’s finest architecture, theatres, embassies and art galleries. 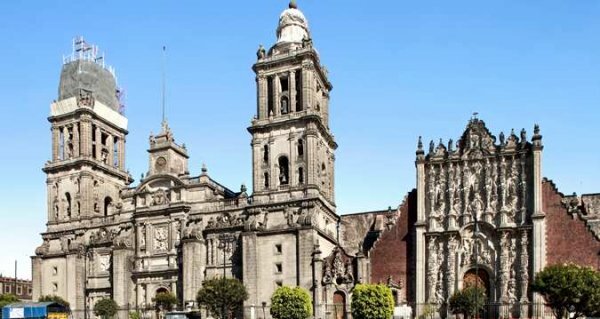 Only a 20-minute drive from Mexico City International Airport, this Mexico City hotel is conveniently located close to the bustling financial and business areas. 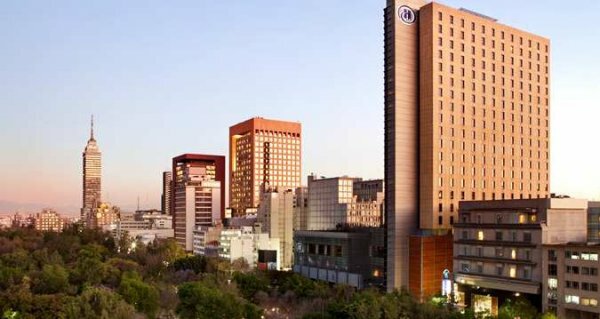 Our Hilton Reforma hotel is recognized as the best of Mexico City hotels – named ‘Best Hotel for Business Travelers’ by TripAdvisor, and boasts an impressive conference and event space that accommodates up to 5, 000 people with ease. 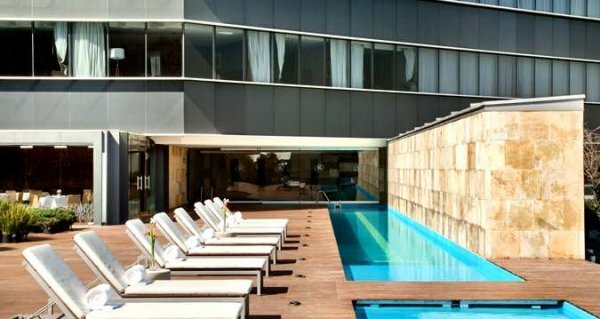 Relax in our 25-meter rooftop pool, work out in the fully equipped fitness center or enjoy a delicious meal in one of the three hotel restaurants offering international cuisine or at our lobby bar. Decorated with original artwork by renowned Mexican artists, the Hilton Mexico City Reforma hotel is proud of its heritage—and the attentive Guest service provided by its Team Members. 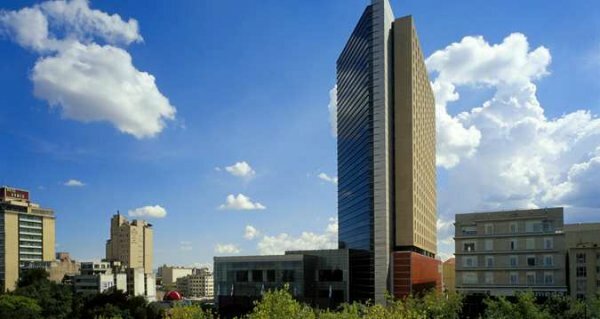 Hilton Mexico City Reforma has facilities unmatched by any other Mexico City hotel and is the ideal choice for business Guests and those planning an event. 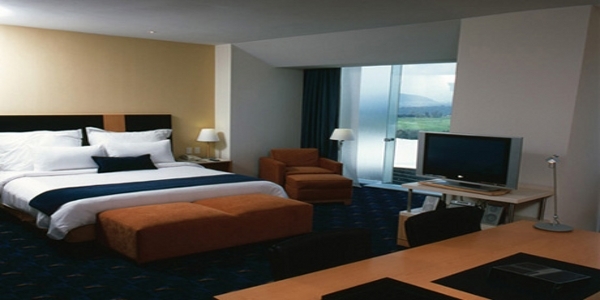 Located 20 minutes from the airport, the hotel features 45,000 sq. ft. of flexible meeting space with 15 meeting rooms and a versatile convention center for up to 5,000 Guests. Enjoy the elegant Executive Lounge and Sky Bar, with panoramic views, drinks, and TV and meeting rooms for up to 8 people, each with personalized service. As the day you’ve been dreaming about for years draws near, our wedding-tested staff stands at the ready to help turn your vision into wonderful reality. The Hilton Mexico City/Reforma hotel understands how important it is that your wedding goes according to plan, so our planner will work with you every step of the way to make certain that’s exactly what happens. From delightful meals to polished service to posh guest rooms, you can count on us. The several resources that we provide will definitely make your wedding a historical success. We have professional staff that will support you and offer you a large variety of options that will help you with anything you need. Our rooms are designed with comfort and convenience in mind; providing a place to unwind or to catch up on work. Explore the various types of rooms, explore the amenities, and choose the space that’s right for you. 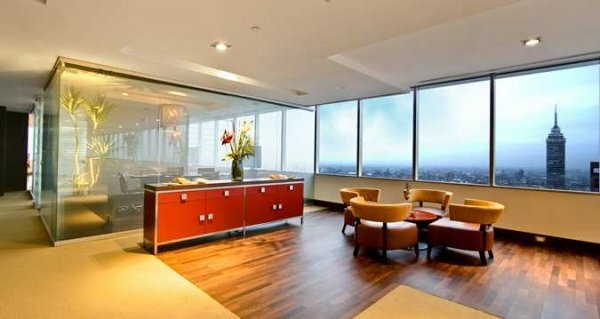 All our suites grant access to the Executive Lounge. Our 400 square foot king and double bedded guest rooms are beautifully decorated in a modern style. Each guestroom offers a 27” flat screen television, Hilton Alarm Clock Radio with MP3 connection, large work area, two line phones with voice mail, in-room safe, coffee maker, mini-bar, iron and ironing board and hair dryer. 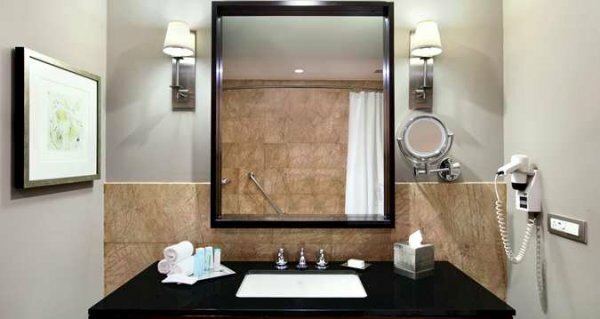 Pamper yourself in our luxuriously appointed over-sized bathrooms. 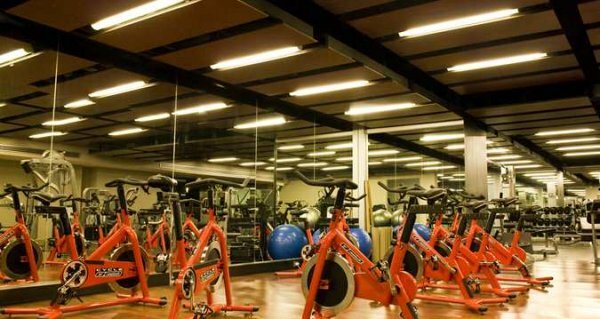 Our hotel offers complimentary access to the fitness center for Gold and Diamond Hilton HHonors® Members. Pamper yourself in our luxuriously appointed oversized 400 square feet king-sized bed guest rooms, which are beautifully decorated in a modern style. For your comfort, enjoy a 37″ flat-screen TV. Each guest room features items from the Hilton Serenity Collection including the Serenity Bath with luxurious bath amenities, cable TV, Hilton alarm clock radio with MP3 connection, large work area with Herman Miller ergonomic chair, two-line phones with voice mail, in-room safe, coffeemaker, mini-bar, iron/ironing board and a hair dryer. Complimentary access to the fitness center. 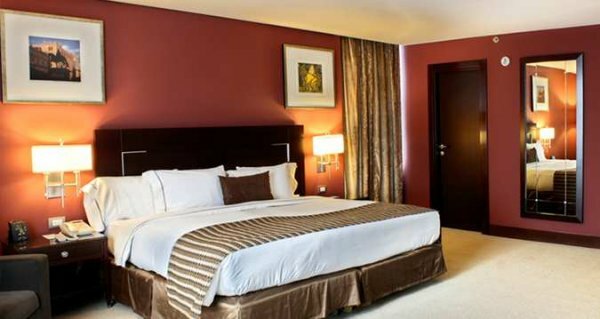 Pamper yourself in our luxuriously appointed large double beds guest rooms, which are beautifully decorated in a modern style. For your comfort, enjoy a 37″ flat-screen TV. Each guest room features items from the Hilton Serenity Collection including the Serenity Bath with luxurious bath amenities, cable TV, Hilton alarm clock radio with MP3 connection, large work area with Herman Miller ergonomic chair, two-line phones with voice mail, in-room safe, coffeemaker, mini-bar, iron/ironing board and a hair dryer. Complimentary access to the fitness center. Enjoy our luxurious corner king bed whirlpool suites with a separate living area and parlor with panoramic park views. This 1, 001 square foot suite includes a private bedroom with dining area. Amenities include high speed internet access, two-line phones , nightly turn-down service, mini-bar, in room safe, Hilton Alarm Clock Radio with MP3 connection, , iron, ironing board, hair dryer and two 27” televisions. 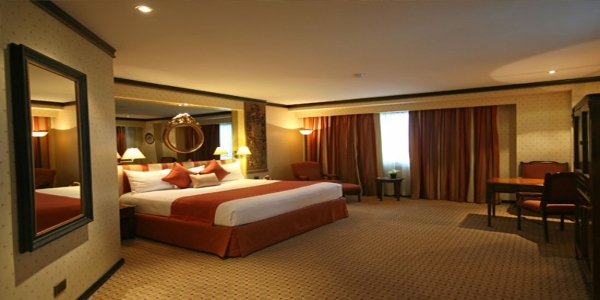 Enjoy our spacious double bedded junior suite furnished in a modern decor. This suite contains a living area and separate sleeping room with panoramic park views. 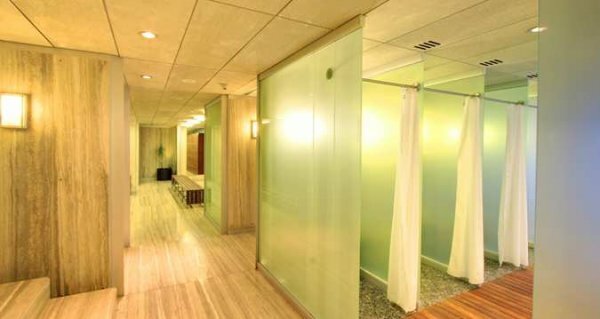 Pamper yourself in our luxurious bathroom containing a separate shower and bathtub. Complimentary access to the fitness center for Gold and Diamond Hilton HHonors® Members. In our 26th and 27th floor enjoy our expansive king-sized bed master suites, ranging from 722 square feet to 892 square feet. This suite features a breathtaking view of the city, separate sitting/dining area and luxuriously appointed oversized bathrooms. For your comfort, enjoy a 37″ flat-screen TV and a 42″ flat-screen TV in the living area. These suites grant you access to our Executive Lounge which includes a full buffet breakfast as well as complimentary refreshing drinks. Each guest room features items from the Hilton Serenity Collection including the Serenity Bath with luxurious bath amenities, cable TV, Hilton alarm clock radio with MP3 connection, large work area with Herman Miller ergonomic chair, two-line phones with voice mail, in-room safe, coffeemaker, mini-bar, iron/ironing board and a hair dryer. Complimentary access to the fitness center. Indulge in our luxurious and oversized king bed whirlpool suites located at the north corner of our hotel, these suites feature a separate living area and parlor, extraordinary panoramic park views in the entire room as well as in the whirpool area. This 1,001 square foot suite includes a private bedroom, a cozy dining area, and a large accommodating bathroom. For your comfort, enjoy a 37″ flat-screen TV and a 42″ flat-screen TV in the living area. These suites grant you access to our Executive Lounge which includes a full buffet breakfast as well as complimentary refreshing drinks. Each guest room features items from the Hilton Serenity Collection including the Serenity Bath with luxurious bath amenities, cable TV, Hilton alarm clock radio with MP3 connection, large work area with Herman Miller ergonomic chair, two-line phones with voice mail, in-room safe, coffeemaker, mini-bar, iron/ironing board and a hair dryer. Complimentary access to the fitness center. 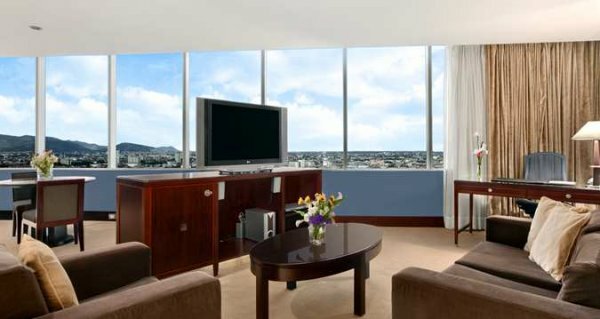 Our 559 square foot king and double-bedded executive corner rooms are spacious and offer superb views. Each is beautifully decorated in a modern style. Each guestroom offers a 27′ flat screen television, Hilton Alarm Clock Radio with MP3 connection, large work area, two-line phones, in-room safe, mini-bar, iron/ ironing board and hair dryer. 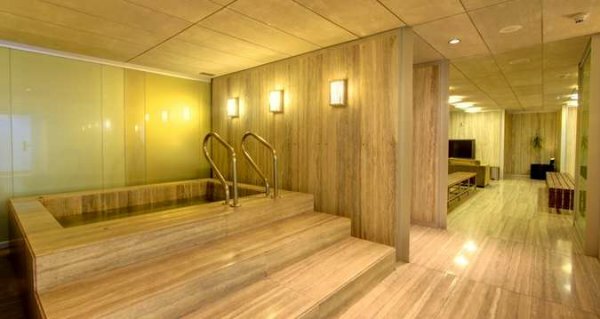 Pamper yourself in our luxuriously appointed over-sized bathrooms. 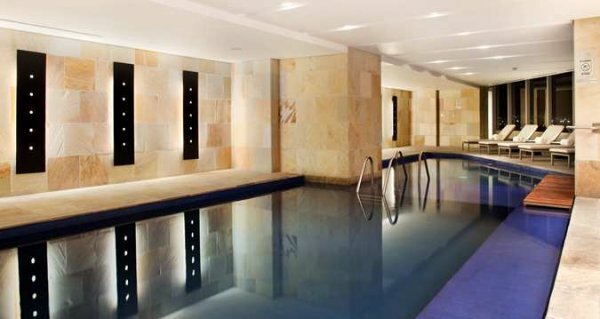 Our hotel offers complimentary access to the fitness center for Gold and Diamond Hilton HHonors® Members. Located on the executive floors of the hotel this executive room offers wonderful city views and access to the executive lounge which includes a full buffet breakfast as well as complimentary refreshing drinks. 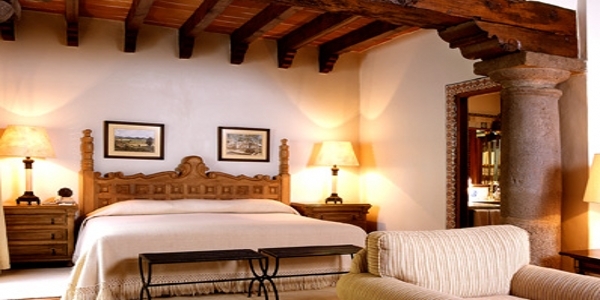 Pamper yourself in our luxuriously appointed oversized 400 square feet king bed guest rooms. For your comfort, enjoy a 37″ flat-screen TV. Each guest room features items from the Hilton Serenity Collection including the Serenity Bath with luxurious bath amenities, cable TV, Hilton alarm clock radio with MP3 connection, large work area with Herman Miller ergonomic chair, two-line phones with voice mail, in-room safe, coffeemaker, mini-bar, iron/ironing board and a hair dryer. Complimentary access to the fitness center. A beautiful and large guestroom located at the southern corner of our hotel that let’s you admire this great City in an unique way with it’s spectacular panoramic views, as well as allowing relax in the small living area with comfortable couches and coffe table, for your confort, enjoy a 37″ flat screen. 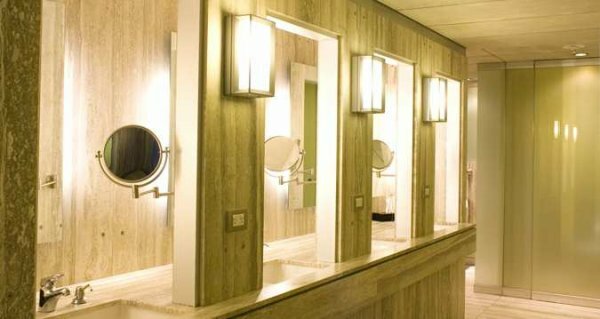 These guest rooms also features one of the biggest bathroom with tub in the hotel, and grant you access to to the Executive Lounge which includes a full buffet breakfast as well as complimentary refreshing drinks. Each guest room features items from the Hilton Serenity Collection including the Serenity Bath with luxurious bath amenities, cable TV, Hilton alarm clock radio with MP3 connection, large work area with Herman Miller ergonomic chair, two-line phones with voice mail, in-room safe, coffeemaker, mini-bar, iron/ironing board and a hair dryer. Complimentary access to the fitness center. Located on the executive floors of the hotel from the 25th to the 27th these guest rooms provide extraordinary views of the city and grant you access to our Executive Lounge which includes a full buffet breakfast as well as complimentary refreshing drinks. These guest rooms features a 37″ flat-screen TV. Each guest room features items from the Hilton Serenity Collection including the Serenity Bath with luxurious bath amenities, cable TV, Hilton alarm clock radio with MP3 connection, large work area with Herman Miller ergonomic chair, two-line phones with voice mail, in-room safe, coffeemaker, mini-bar, iron/ironing board and a hair dryer. Complimentary access to the fitness center. Experience our spacious double beds junior suites furnished in a modern decor. This 815 square foot suite contains oversized closets, a sitting area and a separate living or kitchenette/dining area, with amazing park views. Enjoyed in the luxurious bathroom containing a separate shower and bathtub. Amenities include nightly turn down service. 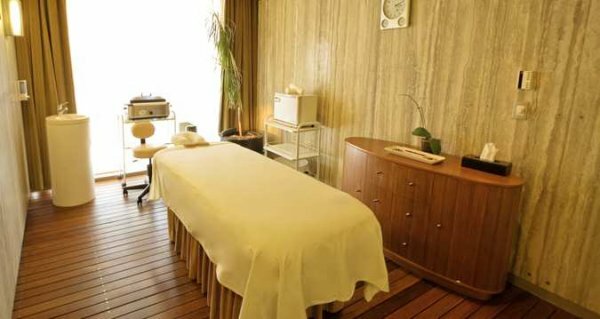 For your confort enjoy a 37″ flat-screen TV in the bedroom and a 42″ flat-screen TV in the living area. (in the case of these suites with living rooms instead of kitchen, an extra flat-screen TV is included). Each guest room features items from the Hilton Serenity Collection including the Serenity Bath with luxurious bath amenities, cable TV, Hilton alarm clock radio with MP3 connection, large work area with Herman Miller ergonomic chair, two-line phones with voice mail, in-room safe, coffeemaker, mini-bar, iron/ironing board and a hair dryer. Complimentary access to the fitness center. Large king bed guest rooms which cover all the needs of our handicapped guests and are beautifully decorated with modern style furniture. 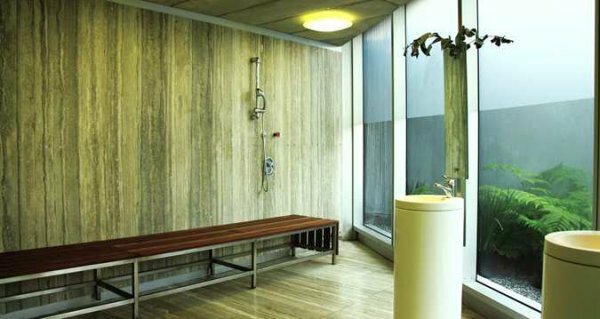 Enjoy the accommodating oversized bathroom with safety adaptations in all the walls for a complete safe shower. For your comfort, enjoy a 37″ flat-screen TV. Each guest room features items from the Hilton Serenity Collection including the Serenity Bath with luxurious bath amenities, cable TV, Hilton alarm clock radio with MP3 connection, large work area with Herman Miller ergonomic chair, two-line phones with voice mail, in-room safe, coffeemaker, mini-bar, iron/ironing board and a hair dryer. 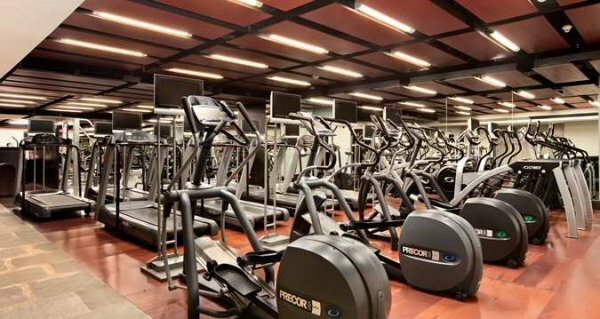 Complimentary access to the fitness center. At Hilton, dining options are designed with you in mind. Start the day with a hearty breakfast or nutritious light bite; savor innovative dishes prepared with only the freshest ingredients. From business brunches to pre-dinner drinks and everything in between, the options at Hilton are catered especially for you. You can savor top artisan Mexican cuisine in El Cardenal Restaurant where we respect the tradition that goes into preparing the food. 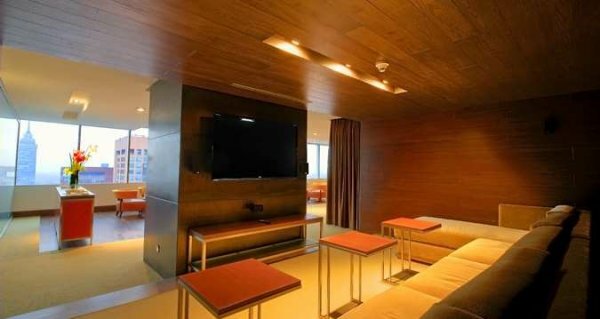 The Lobby Lounge is located at Lobby level, with comfortable lounge furniture. Our Los Dones Restaurant serves an international cuisine breakfast, and a la carte menus are available. Dinner is a la carte. When hunger strikes any time of the day, treat yourself to a selection of comfort foods, snacks, and beverages from our 24-hour room service. Terraza Alameda is half outdoor garden and half restaurant with roof. 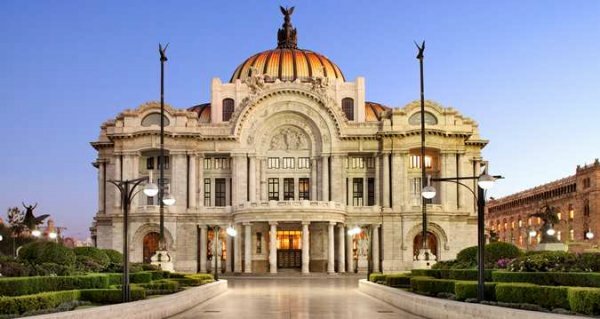 You can view the Palacio de Bellas Artes from our restaurant. We also offer a Sunday Brunch.